Thu., Feb. 7, 2019 12:00 a.m. 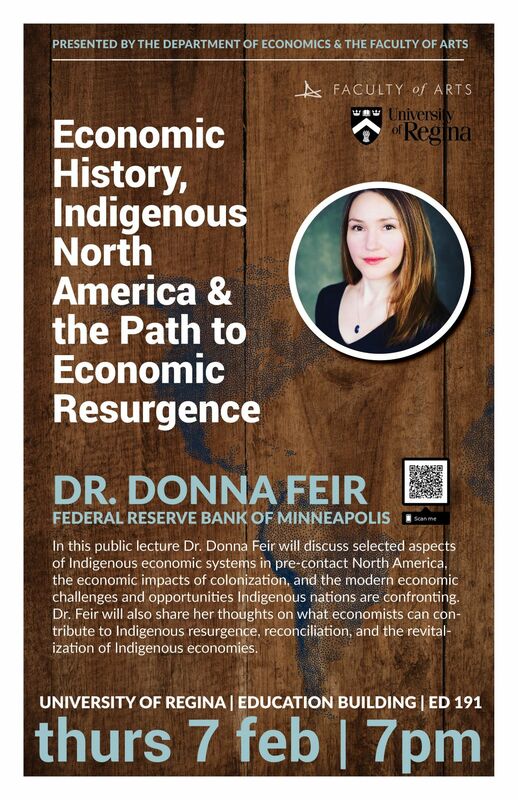 The Department of Economics and the Faculty of Arts is pleased to present a public lecture by Dr. Donna Feir, Research Economist at the Center for Indian Country Development, Federal Reserve Bank of Minneapolis. In this public lecture Dr. Donna Feir will discuss selected aspects of Indigenous economic systems in pre-contact North America, the economic impacts of colonization, and the modern economic challenges and opportunities Indigenous nations are confronting. Dr. Feir will also share her thoughts on what economists can contribute to Indigenous resurgence, reconciliation, and the revitalization of Indigenous economies. All are welcome and free parking on campus will be available in lots 2 & 4. "The Slaughter of the Bison and Reversal of Fortunes on the Great Plains." Abstract: In the late 19th century, the North American bison was brought to the brink of extinction in just over a decade. We show that the bison’s slaughter led to a reversal of fortunes for the Native Americans who relied on them. Once the tallest people in the world, the generations of bison-reliant people born after the slaughter were among the shortest. Today, formerly bison-reliant societies have between 20-40% less income per capita than the average Native American nation. We argue that federal Indian policy that limited out-migration from reservations and restricted employment opportunities to crop based agriculture hampered the ability of bison-reliant societies to adjust in the long-run, generating lasting regional disparities associated with other indicators of social dislocation, such as suicide and unrest. For more information about either of these events please contact Dr. Brett Dolter, Department of Economics, at brett.dolter@uregina.ca or 306-337-2923.